We were greatly saddened to learn today of Harvey K. Littleton’s passing on December 12 at the age of 91. Harvey as you’re probably aware was broadly considered to be the father of the American Studio Glass Movement. His beautiful and inspiring works could be seen displayed in numerous prestigious museums including the Smithsonian Institution, The Metropolitan Museum of Art, the High Museum of Art, the Los Angeles County Museum of Art, and the Museum of Modern Art in New York. In addition to being a brilliant artist he was also a devoted educator and advocate of the arts and art education. One of Littleton’s most famous students was internationally renowned glass artist Dale Chihuly, founder of the world-famous Pilchuck Glass School. Mr Littleton’s contributions to the world of art glass and its community cannot be overstated and he will be sorely missed. 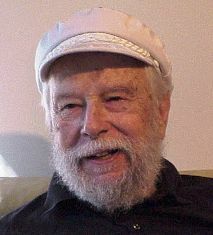 Donations in his name can be made to The Hospice and Palliative Care Center of Mitchell County which cared for him during his final days and to the Penland School of Crafts “Harvey and Bess Littleton Scholarship Fund” that provides a full scholarship for a two-week summer session in hot glass to one lucky recipient. Next post: M.I. Hummel Going Out Of Business In The U.S.